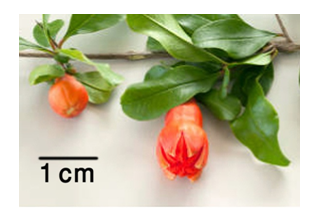 For a long time, extracts of Punica granatumhave been used in alternative and complementary medicine. The object of the present study was to evaluate the activity of Punica granatumleaves hydro-methanolic extract against some Gram-positive, Gram-negative bacteria and Candida albicans using agar diffusion assay.The leaves yielded 34.7% of raw semisolid extract after maceration in hydro-methanol (50:50 v/v) andevaporation.After lyophilization, the dry powder was reconstituted in Muller-Hinton broth to get a concentration of 128 mg/mL; from which further 5lower concentrations have been prepared (64, 32, 16, 8, and 4 mg/mL in Muller-Hinton Broth).The extract exhibitedconcentration-dependent activity against some Gram-positive bacteria, namely,Listeria monocytogenes (20.67 ± 0.82), Clostridium perfringens (17.33 ± 0.52), Staphyllococcus aureus (10.5 ± 0.55), Bacillus cereus (8.83 ± 0.41), and Enterococcus fecalis (6.33 ± 0.52);and against three Gram-negative bacteria, namely, Shigellaflexneri (13.33 ± 0.8), Vibrio parahaemolyticus(12.17 ± 0.42) and Proteus vulgaris (8.5 ± 0.55);as well as against Candida albicans (15.8 ± 0.98); (the values are in mm after 128 mg/mL extract). However, the extract was without any visible activity againstEscherichia coli, Salmonella typhimuriumand Klebsiellaaerogenes.The minimum inhibitory concentrations (MICs) against susceptible organisms were1.06 mg/mL (Clostridium perfringens), 1.11 mg/mL (Vibrio parahaemolyticus), 2.08 mg/mL (Staphyllococcus aureus), 2.16 mg/mL (Bacillus cereus),2.76 mg/mL (Candida albicans), 3.07 mg/mL (Listeria monocytogenes), 3.80 (Shigella flexneri), 12.92 mg/mL (Proteus vulgaris) and 15.55 (Enterococcus faecalis). These data may indicate that Punica granatumleaves extract is active against some pathogenic bacterial strains and thus may be useful in treatment of disease conditionscaused by these bacteria at least as a complementary medicine. Cockerill FR, Clinical, Institute LS. Performance standards for antimicrobial disk susceptibility testing: Approved standard. National Committee for Clinical Laboratory Standards; 2012.